StarUML v2.0.0-beta2 is now available for download. This release includes the following features and fixed issues. 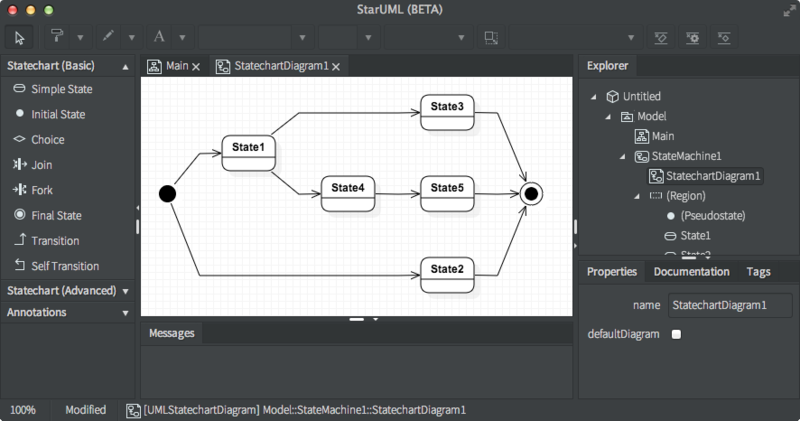 Now you can layout diagrams automatically (except Sequence Diagram). The menu could be found in Diagram > Layout Diagram menu. There were some bugs to show expression errors (e.g. Attribute Expression). We have changed the way of showing errors in QuickEdit. Now, QuickEdit shows shake animation when user enters invalid expression like the below video. Enter: Popup QuickEdit on selected view. Quick question here… Running on Windows 8.1 64-bit, I can’t create any new diagrams. I’m stuck with the original class diagram. Under “Model / Add” and “Model / Add Diagram” menus, all the options are disabled. In the explorer pane, right-click “Add” and right-click “Add Diagram” both have no effect. What am I missing? I had this problem with Beta 1 as well. Actually, we couldn’t tested on various OS versions. Could you post the question on our Forum (https://groups.google.com/forum/#!forum/staruml) again to share with other users? Then, I’ll give an detailed instruction to check the problem.